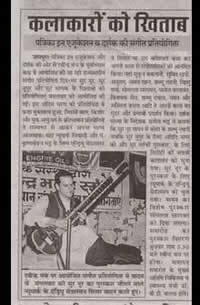 In the winter of 2003, at the invitation of his guru, sitar maestro Pandit Krishna Mohan Bhatt, Andrew Mendelson traveled to Jaipur, India to study North Indian classical music. While there, he learned of a local music competition and on a whim signed up. It turned out this competition was the largest of it's kind in the state of Rajasthan, and he was the first American ever to participate. Remarkably, he won. A Cricket in the Court of Akbar documents Andrew's return to India to compete again at the Sri Mahendra Bhatt Music Competition, this time in the Tournament of Champions. As the competition day approaches, Andrew's fears grow as he struggles to prepare. He soon discovers that his desire to take part in the competition (and document the process) puts him at odds with the person who could help him most, his guru. 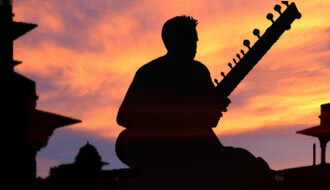 Sitar in hand, Andrew attempts to navigate the ancient tenets of Indian music before the final face-off against some of India's most talented young musicians. Throughout the film, a variety of experts from India and the United States offer insight into the timely issue of global cultural exchange and the timeless appeal of North Indian classical music. Request the film in your area!